Will you put a spring in your step in the Spring Walk for Spring Hall? 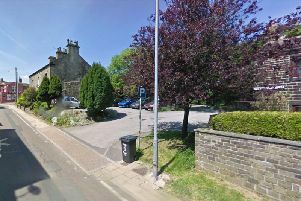 Calderdale’s only special high school is calling on the community to take part in a Spring Walk for Spring Hall - Ravenscliffe High School’s new £3m sixth form and community centre. On April 26, people of Calderdale - businesses, organisations, friends and family - are asked to organise a walk along the Calder and Hebble Navigation with donations and sponsorship going to building Ravenscliffe@SpringHall - Ravenscliffe High School’s, Skircoat Green, Halifax, new specially designed and equipped sixth form. Walkers are invited to meet with Ravenscliffe staff and friends at Copley Cricket Club, Copley, Halifax, at the end of their walk, from 4pm, where crowds will gather to watch an inspirational video of two brothers, who are wheelchair users, being specially lifted to the top of 100-ft high Stoodley Pike, Todmorden. Ravenscliffe student Nathan Greenwood, 12, and his 13-year-old brother Andrew, a pupil at Ryburn Valley High, Sowerby Bridge, pictured, will be lifted using special equipment by Calder Valley Search and Rescue Team to the viewing platform of Stoodley Pike on the morning of April 26, in an aspirational Aim High mission - to show how great things can be achieved when a community pulls together. The dream to build Ravenscliffe@SpringHall became a reality last year after a massive community fundraising response from the people of Calderdale - who hold Ravenscliffe, Skircoat Green, Halifax, in their hearts - was cemented with the commission of the building of a new sixth-form centre at nearby Spring Hall athletics track. Calderdale Council pledged to fund half of the building cost to accommodate sixth-formers from the over-subscribed high school and a massive community drive followed as people of Calderdale bought a brick for Ravenscliffe, attended the Spring Ball for Spring Hall, donated to staff and students in a special supermarket buskathon and more. Now, the last leg of the community campaign is to raise £500,000 to equip Ravenscliffe@SpringHall with essential equipment to deliver specially designed teaching to teenagers with special educational needs. Special equipment includes height adjustable changing beds with special hoists which cost up to £8,000 each, adapted bikes for wheelchair users costing £6,000 each, special books for visually impaired students costing £80 each, and specialist bean bags costing £600 each. The centre will boast facilities including: a cafe and food preparation facilities accessible to the community; five specially equipped classrooms with availability for public use out of school hours; sports changing rooms; bike storage and maintenance facilities for the school’s fleet of adapted bikes; Halifax Harrier coaching rooms; and specially adapted toilets. Building work is expected to begin in January 2016. The school is a fifth of the way there to financing the interior having raised £100,000 since September 2014. Grants, donations and cornerstone funding, it is hoped, will make up the deficit. Now, you can help make the dream a reality by taking part in the Spring Walk for Spring Hall.